In order for organisms to grow, cells have two options: they must either replicate themselves to create more cells, or the cells themselves must expand in volume. In humans, tissues such as the skin and blood contain cells that are actively dividing, whilst other tissues such as fat contain cells that expand (good if you need energy for winter, bad if you are trying to fit into some expensive jeans). Other cells, such as neurons, will never divide again once they are terminally differentiated; they are post-mitotic. In the process of replicating themselves, cells have another choice: do they want to make an identical copy and be left with two cells? Or do they want to make four “half-copies”, in preparation for sexual reproduction, where their genetic content will be made whole again by the process of fertilisation? This choice is the choice between mitosis and meiosis. This article will explore the characteristics of both kinds of cell division, shining a light on how they are similar and in which aspects they are crucially distinct. We will also explore the research into these processes and how cell division might go awry to cause disease states such as cancer and Down’s Syndrome. What is the purpose of this process? To create gametes with only one copy of the organism’s genetic information, in preparation for sexual reproduction. 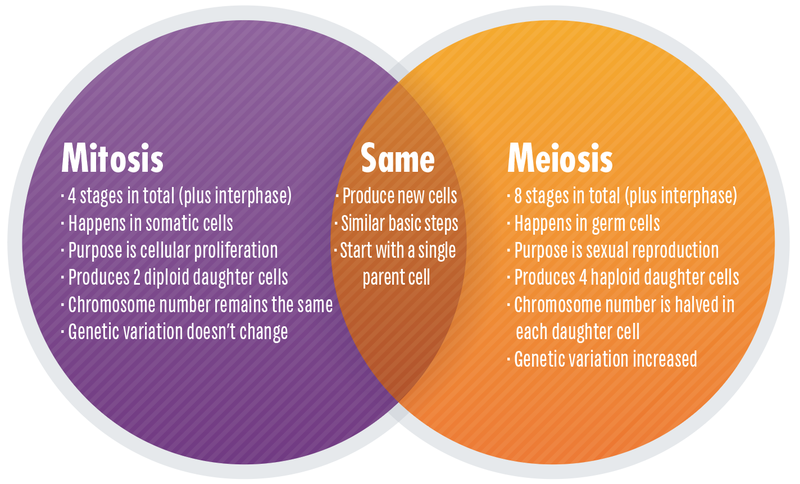 Various steps in meiosis create opportunity for genetic diversity in the daughter cells. This is the raw substrate for evolution. What is the outcome of this process? Two diploid cells with identical genetic information. Four haploid cells with different genetic information. Which organisms perform this process? Mitosis is performed by unicellular and multicellular eukaryotes.Bacteria have their own version of mitosis called “binary fission”.This is distinct from meiosis as bacteria typically have one circular chromosome,which is not contained within a nucleus, like eukaryotic chromosomes. Only organisms which perform sexual reproduction. Archaeaand bacteria do not do this, so it might be tempting to think that unicellularorganisms do not sexually reproduce. However, there are exceptions; buddingyeast will form haploid spores under nutritional deprivation. Mitosis is usually shorter than meiosis. The process can take over 10 hours for mammalian cells in culture , budding yeast can take ~80 minutes to complete a cell cycle , whilst bacteria can divide every 20 minutes. What is an example of a disease caused by an error in this process? Uncontrolled mitosis occurs in cancer, where either genes that stop cell division (tumour suppressors) are switched off, or genes that encourage cell division (oncogenes) are overactive. Errors in meiosis can lead to the wrong number of chromosomes ending up in germ cells, this is called aneuploidy. This can trigger miscarriage, but is occasionally tolerated. One example is Down’s syndrome, caused by trisomy 21. Another example is Klinefelter syndrome, where XY males have an additional X chromosome. Mitosis is the Greek word for thread, after the thread-like chromosomes that can be seen under the microscope in dye-stained cells during cell division. Meiosis means a “lessening” in Greek. This refers to the outcome of meiosis, where the genetic information in each new cell is halved. Cell division occurs as a part of the “cell cycle”. Just like your day has a routine from day to night, cells have routines of their own. The cell cycle is generally described as consisting of four main phases: G1, S phase, G2 and mitosis (or meiosis). Cells can also take a break from the grind of the cell cycle, in a state called G0 or senescence (note that some cells are permanently in G0). External growth factors can stimulate cells in G1 or G0 to proceed through the rest of the cycle, an example is Nerve Growth Factor (NGF), which promotes neuron growth. The restriction point is a special “point of no return” in G1 when cells no longer respond to removal of growth factors and will continue to progress to S phase no matter what. There are also internal signals that tell the cell to progress, these proteins are called cyclins and the cyclin that promotes mitosis is called cyclin B. S phase is especially important as this is the point at which the cell’s entire genome is duplicated through the process of semi-conservative DNA replication. Meiosis and mitosis both have a prophase, metaphase, anaphase, telophase and cytokinesis. In meiosis, prophase, metaphase, anaphase and telophase occur twice. The first round of division is special, but the second round is more like mitosis. In mitosis, prophase, metaphase, anaphase and telophase occur once. Chromosomes condense and the centrosomes begin to form an early spindle. Meiotic prophase I is much longer that mitotic prophase. During prophase I homologous chromosomes make contacts with each other called chiasmata and “crossing over” occurs. This is where chromosomes exchange sections of DNA. This is important for generating genetic diversity but is also crucial mechanically to hold homologous chromosomes together. Mitotic prophase is much shorter that meiotic prophase I. There is no crossing over in mitosis. In metaphase II of meiosis, and metaphase of mitosis, chromosomes line up along the metaphase plate due to the action of microtubule spindle fibres emanating from the centrosomes located at opposite cell poles. These fibres are attached to the chromosomes by kinetochores at the centromeres of the chromosomes. In meiotic metaphase I pairs of homologous chromosomes line up along the metaphase plate. The way in which the homologous pairs are oriented randomly with respect to the cell poles is referred to as the law of independent assortment and ensures a random and independent distribution of chromosomes to the daughter cells of meiosis I and ultimately to the haploid gametes at the end of meiosis II. In mitotic metaphase a single chromosome/ pair of chromatids line up along the metaphase plate. Sister chromatids are identical and so the orientation of the chromosome doesn’t carry any meaning. In anaphase, chromosomes are split to opposite poles of the cell. In anaphase of meiosis I cohesin at the centromeres of the chromosomes is not cleaved and it therefore continues to hold sister chromatids together as the homologous chromosomes are segregated to opposite cell poles. In anaphase of mitosis (and meiosis II), cohesin protein holding the centromeres of the sister chromatids together is cleaved, allowing the sister chromatids to segregate to opposite poles of the cell, at which point they are called chromosomes. A nuclear membrane reforms around the newly separated chromosomes, which begin to uncoil, becoming less condense. The spindle microtubules disassociate. Each daughter cell will inherit one centrosome. The cell plasma membrane pinches, to leave two daughter cells with separate plasma membranes. In meiosis, cytokinesis must occur twice: once after telophase I and again, after telophase II. In mitosis, cytokinesis does not always occur, some cells divide and are multinucleate, like muscle cells. 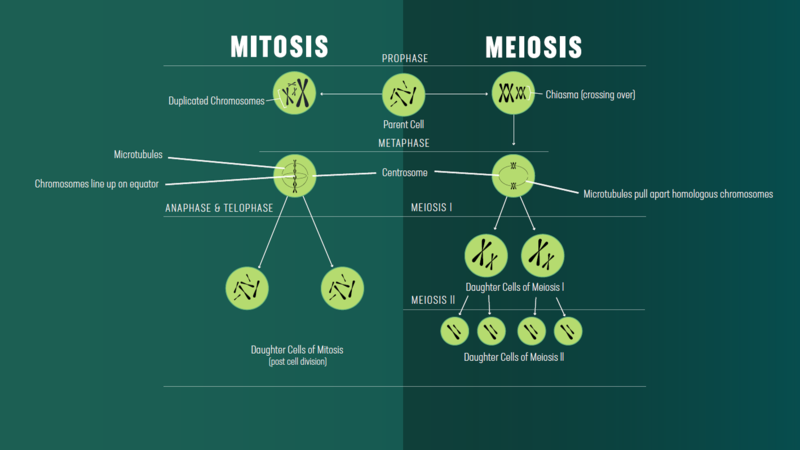 Another way to understand the progression of mitosis and meiosis is by thinking about what is happeningto the chromosomes, centrosomes, nuclear membrane and cell plasma membrane at each stage of the process. Here we show how to do this for mitosis, why not try to recreate this table for meiosis? 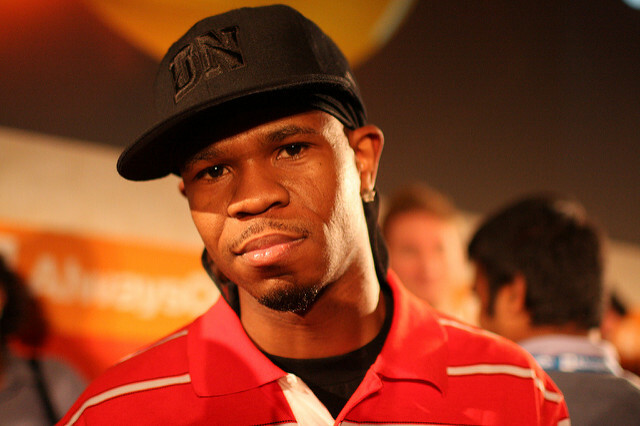 Mnemonics are also helpful, for example a useful mnemonic to remember the order of the steps in mitosis is “I Prefer Mating At Teatime” – Chamillionaire. Interphase Are uncondensed but are still organised. The entire genome is replicated to create two identical semi-conserved copies of each chromosome. Prophase Condense. Duplicated chromosomes are called sister chromatids. Metaphase Align along the metaphase plate, the midpoint between the two centrosomes. Sister chromatids are joined at the centromere by proteins that form a structure called a kinetochore. Anaphase Cohesin is cleaved at the centromere of chromosomes, resulting in sister chromatids being pulled to opposite poles of the cell. Telophase Chromosomes begin to uncoil, becoming less condensed. Cytokinesis Chromosomes have returned to their interphase structure. This is a topic of much research, but it seems as though each chromosome occupies its own territory within the nucleus. Interphase The centrosome is duplicated. Prophase Microtubules begin to form an early mitotic spindle between the duplicated centrosomes. Metaphase The two centrosomes are now located at opposite poles of the cell. Anaphase Microtubules emanating from the centrosomes shrink as the tension holding the chromosomes at the metaphase plate is broken by cohesin cleavage. Telophase The centrosomes remain segregated to opposite sides of the cell. Each daughter cell will receive one centrosome comprised of two centrioles. Cytokinesis Centrosomes signal to the cell that it is okay to proceed with cytokinesis. Research shows that cells where centrosomes are destroyed with a laser beam cannot undergo cytokinesis. Metaphase In higher eukaryotes like vertebrates, by the time metaphase occurs the nuclear envelope has broken down. This is caused by phosphorylation of nuclear lamin proteins. Telophase A nuclear envelope reforms around the chromosomes in each daughter cell. Cytokinesis Pinches to form two separate membranes around the two daughter cells. The process of cell division is an intricate dance of molecular machinery that has fascinated researchers for hundreds of years. Advances in microscopy have had a huge impact on the field, from its humble beginnings observing metaphase chromosomes under the light microscope, to more sophisticated technologies today that can ask questions at the molecular level. Research into the cell cycle has also been highly rewarded, with the 2001 Nobel Prize in Physiology/Medicine being awarded to Tim Hunt, Paul Nurse and Leland Hartwell for their joint discovery of cyclins and cyclin-dependent kinases: the key regulators of the cell cycle . However, despite our progress, many questions still remain. How do cells promote faithful chromosome segregation in mitosis? While there is only one way for mitosis to go right, there are many ways for it to go wrong. For example, in early mitosis, if there are incorrect contacts between microtubules and chromosomes, chromosomes can become misaligned, which can lead to incorrect segregation of sister chromatids. In late mitosis, how is the cell certain that the time is right to perform cytokinesis? The chromosome passenger complex (CPC) is a molecular guardian angel that acts at many stages of mitosis to safeguard the fidelity of the process. At the start of mitosis, the CPC localises all over the chromosomes and acts to modify chromatin, during mitosis it moves to the chromosome centromeres to prevent incorrect microtubule attachments and before cytokinesis the CPC finds its way to the central spindle. Therefore, a question of ongoing research is how does the CPC elegantly re-localise throughout mitosis to save the day? •Vader, G., Medema, R. H., & Lens, S. M. (2006). The chromosomal passenger complex: guiding Aurora-B through mitosis. The Journal of cell biology, 173(6), 833-837. •Kabeche, L., Nguyen, H. D., Buisson, R., & Zou, L. (2018). A mitosis-specific and R loop–driven ATR pathway promotes faithful chromosome segregation. Science, 359(6371), 108-114. How are homologous chromosomes held together, and then separated in meiosis I? You might remember from above that it is the protein cohesin that holds together sister chromatids in metaphase of mitosis and metaphase II of meiosis. However, in meiosis I homologous chromosomes must be held together in metaphase I, before these ties are swiftly broken during anaphase I. This feat is performed by a miraculous cellular zipper called the synaptonemal complex (SC). This zipper must be strong enough to hold chromosomes together, but it must also be disassembled equally efficiently, otherwise homologous chromosomes will not accurately segregate in anaphase I, leading to a potentially disastrous genetic inequality in the daughter cells. How exactly this zipper disassembles is a hot topic of research. •Argunhan, B., Tsubouchi, T., & Tsubouchi, H. (2018). Polo is not solo in meiosis. Cell Cycle, 17(3), 273-274. •Gao, J., & Colaiácovo, M. P. (2017). Zipping and unzipping: protein modifications regulating synaptonemal complex dynamics. Trends in Genetics. 1)Bennett, M. D. (1977). The time and duration of meiosis. Phil. Trans. R. Soc. Lond. B, 277(955), 201-226. 2)Jett, J. H. (2015). How long does it take a cell to divide? Cytometry Part A, 87(5), 383-384. 3)Brewer, B. J., Chlebowicz-Sledziewska, E., & Fangman, W. L. (1984). Cell cycle phases in the unequal mother/daughter cell cycles of Saccharomyces cerevisiae. Molecular and cellular biology, 4(11), 2529-2531. 4)Clift, D., & Schuh, M. (2013). Restarting life: fertilization and the transition from meiosis to mitosis. Nature reviews Molecular cell biology, 14(9), 549. 5)Paweletz, N. (2001). Walther Flemming: pioneer of mitosis research. Nature Reviews Molecular Cell Biology, 2(1), 72. 6)Nurse, P. M. (2002). Nobel Lecture: Cyclin dependent kinases and cell cycle control. Bioscience reports, 22(5), 487-499.